Charcoal ovens are made from high quality materials and built in parts that ensure long life span of charcoal oven. In the oven you can prepare almost any king of food – from meat and fish to even vegetables and pizzas. 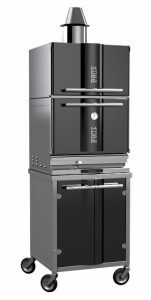 Charcoal ovens are user friendly and time and cost efficient. In case of any questions please do not hesitate to contact us, we will be happy to help you.